On a night when his offense put up 15 runs on 18 hits, Gabriel Arias managed to steal the show. San Diego's No. 20 prospect cycled on a 5-for-6 night, driving in a career-high five runs as Class A Fort Wayne thumped South Bend, 15-5, on Monday. "He's always been a really good defender and he's got a plus-plus arm," TinCaps hitting coach Jon Mathews said. "That's always been what he's been really proud of, but in this past six weeks or so, he's really gotten invested in his at-bats. Tonight when they made a pitching change, he was the first guy who came up and asked, 'What's this guy got? How hard does he throw? What pitches does he throw? What percentages?' He's always been known as a defender first, in his mind even, and these last six weeks, he's really started to invest in his at-bats." Nearing the end of his best month of the season, Arias started off with an RBI single to center field in the top of the first inning. The 18-year-old led off the second with another single to center and belted a two-run homer to left-center in the fourth, his sixth blast of the season. Arias added his fourth RBI on a double to center in the sixth before being retired for the only time on the night on a groundout to short in the seventh. That set the stage for the shortstop's final trip to the plate. He finished off the first cycle since Fort Wayne's inaugural season -- Rene Lopez on May 27, 1993 vs. Beloit -- by checking off its toughest component on a two-out triple to center in the ninth. "Some of the most encouraging things, he's always been really good to right-center," Mathews said. "When he finished his cycle off with a triple, he hit a ball to right-center, but he hit two balls to the pull side -- the home run and he hit a double to left-center also against pretty good fastballs. That was as encouraging as anything to me, plus the fact that he put together a 10-pitch at-bat and got a two-strike hit. It was a really neat night for Gabe. "The whole dugout was excited. The clubhouse kid came running down to get the ball for Gabe and the umpire stopped the game, so it was really neat." Arias, who had notched more than three hits in a game just once in his career prior to Monday, continued his surge to the finish line in 2018. Heading into Monday, the Venezuela native had posted a .279/.367/.492 slash line with 12 doubles, a triple, four homers and 18 RBIs. Prior to that stretch, Arias was a.215/.273/.275 hitter with one triple and one home run. The five-hit night gave him at least one extra-base hit in 10 of his last 13 games. "Balls come off of his bat hotter than most guys that we have," the hitting coach said. "I think he's starting to see some results, and with that comes a little bit of confidence, and with that comes the pure enjoyment on the offensive side of the ball. He looks forward to hitting now, and it's been a neat thing to see him grow as an offensive player." 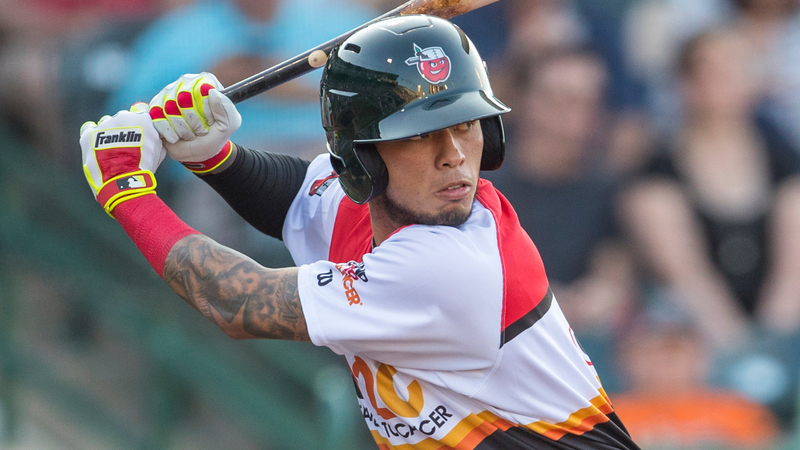 Arias told Fort Wayne broadcaster John Nolan his evolving approach has keyed his offensive resurgence. "I go in with a plan because I'm working with Mathews to have a plan when I take at-bats," he said. "I'm more calm, taking pitches, staying hard-working." The outfielder also had an emotional component to the historic night, remembering his grandfather, Pedro, who passed away earlier this year. "I was thinking of my grandfather the third [at-bat]," Arias said. "My grandfather told me always when I hit home runs to keep working. Be hard-working every single day. When I hit a home run, I think of my grandfather and say thank you." Arias was one of five Fort Wayne players with multiple hits on the night. One spot ahead of him in the order, the TinCaps' No. 3 hitter Owen Miller, the No. 30 Padres prospect, went 4-for-6 with two doubles and four RBIs. "Everybody swung the bats really well," Mathews said. "We had a rough go last night (a 10-9 loss in which Fort Wayne allowed five in the bottom of the ninth), gave up a nice lead in the ninth inning. So it was nice to see everybody come back tonight and rebound a little bit because they easily could've gone in the tank, but didn't do that. It was encouraging."